One woman's story of finding God's purpose and hope through loss. Beryl's story is a miraculous account of the restoration of a heart broken by rejection, the pain of giving up a child to adoption, the turmoil of a troubled marriage, the guilt of abortion and the shattering of her world when her husband Ken is tragically killed. 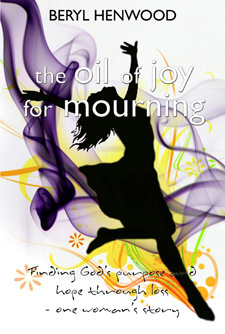 'The Oil of Joy for Mourning' sums up an incredible journey of transformation as the grace of Jesus Christ pursues, embraces, moulds, shapes and releases another champion for his Kingdom. "Beryl's story epitomizes the truth that God is never more accessible to us than when we desperately need him and even actively pursues us in our pain, to reveal his loving forgiveness and healing power, to turn despair and defeat into glorious victory." A passionate missionary, intercessor, evangelist, teacher and pro-life advocate, Beryl is powerfully anointed with the Holy Spirit to minister to other broken lives, the healing and freedom she has found in her Lord.